Are you aware of the cost, security, and privacy differences between wood, lattice, and chain linking fences? Jay Fencing provides high quality fencing services to commercial and residential properties, let our expert and friendly team help you today. The following chart compares wood, lattice, and chain link fencing option we provide against one another. Knowing the pro’s and con’s of each type of fencing can be the difference to a safe and functional living environment for your workplace or family. First up we provide you with an analysis based on 5 value areas to guide a decision on an appropriate fencing solution. 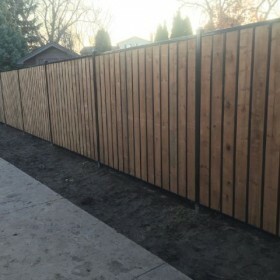 Pros: Wood fences offer a natural look and feel, providing a tight enclosure to ensure greater levels of privacy compared to other options. It offers a functional level of aesthetic appeal due to the unique tints and hues that come along with aging or different types of wood. The security offered by this enclosure also provides a basic level of defense against intruders. Cons: Due to the shelf life of wood aging over time, these fences can incur further costs for maintenance and upkeep -particularly when the paint or wood colors begin to fade. Wood also tends to get damaged if there are collisions or projectile impact that could scratch and tarnish the surface. Applicable property: This type of fencing solution is commonly used for residential properties. Pros : The lattice fence visually offers a mix between the wood and chain linking options. 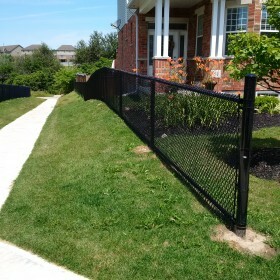 It’s strongest feature is it’s visually intriguing fence headers which offer an accented decor. This fencing option provides a more open atmosphere and is great for homes that love entertaining guests. 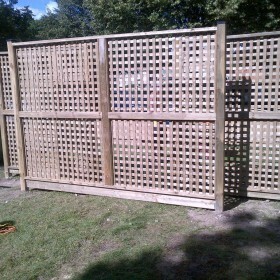 Cons: Lattice fence offers limited amount of privacy due to the design. It also performs behind the other options in terms of durability, preferring a visual appeal instead. Applicable property: This type of fencing is typically suited for residential properties. Though the hospitality and art industry do tend to break the mould every now and then. Pros: This option offers a strong mix of durability, security, visual design, and is cost-effective. The Chain links can withstand a greater amount of impact and wear and tear compared to the above options. Chain fencing is minimal, so that it doesn’t take attention away from the architecture of your home. Cons: Despite it’s many benefits, the chain link fencing is set back by limited privacy as the trade off in visual design particularly around material layout doesn’t provide as much sound and visual buffering as the wood options. Applicable property: Due to it’s versatility the chain link fencing can be used for both commercial and residential perimeter solutions. We service customers everywhere from Stratford, to Brantford, to Mississauga, to Fergus and everyone in between. Book a consultation today and Jay Fencing can help you pick the right perimeter for your property.